Chemical characterization of deposits are important in the geology field and to the mining industry. 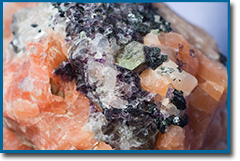 Raman spectroscopy offers the ability to characterize select bulk minerals without sample preparation or caustic chemical reagents, and in near-real time. A Raman analyzer equiped with a microscope can provide information on inclusions leading to insights in the geological formation process. The use of fiber-optic probes can allow in-situ identification of new deposits or provide insight during the mining recovery operation. In both cases the analysis is conducted non-destructively, and in a non-contact manner limiting the exposure of the analytical equipment to dirty, abrasive, and caustic environments. For these reasons Raman spectroscopy is gaining attention and establishing itself as a characterization tool in studying geochemistry.